Perfect timing can mean the difference between success and failure. But how does it happen? Is it blind luck, or some sort of genius skill that’s unavailable to the rest of us? Research from the fields of psychology, biology, and economics reveals the truth — that timing comes down to science. And that means anyone can learn how to make timing work to their advantage. That’s the topic of the new book from one of my favorite authors, Dan Pink. When: The Scientific Secrets of Perfect Timing joins Pink’s other bestsellers such as Drive, A Whole New Mind, and To Sell Is Human as revealing guides to forging smarter businesses and personal lives. Tune in to hear Dan and I discuss how to use the hidden patterns in your day to build the ideal schedule. You’ll also discover the power of breaks as productivity aids, and much more. This episode of Unemployable is brought to you by the all new FreshBooks, easy accounting software for freelancers, coaches, and consultants. You’ve simply got to try it for yourself with this special unrestricted 30-day free trial — just click here and then enter Unemployable in the “How Did You Hear About Us” section. Daniel Pink: I’m Daniel Pink. I’m the author of When: The Scientific Secrets of Perfect Timing, and I’m unemployable. Voiceover: Welcome to Unemployable, the show for people who can get a job, they’re just not inclined to take one — and that’s putting it gently. In addition to this podcast, thousands of freelancers and entrepreneurs get actionable advice and other valuable resources from the weekly Unemployable email newsletter. Join us by registering for our Free Profit Pillars Course, or choose to sign up for the newsletter only at no charge. Simply head over to Unemployable.com, and take your business and lifestyle to the next level. That’s Unemployable.com. Brian Clark: Perfect timing can mean the difference between success and failure. How does it happen? Is it blind luck or some sort of genius skill that’s unavailable to the rest of us? Research from the fields of psychology, biology and economics reveals the truth — that timing comes down to science. And that means anyone can learn how to make timing work to their advantage. 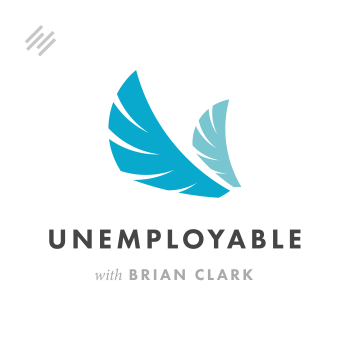 I’m Brian Clark and this is Unemployable. Thanks for tuning in. Timing is the topic of the new book from one of my favorite authors, Dan Pink. When: The Scientific Secrets of Perfect Timing joins Pink’s other bestsellers such as Drive, A Whole New Mind and To Sell Is Human as revealing guides to forging smarter businesses and personal lives. Tune in to hear Dan and I discuss how to use the hidden patterns in your day to build the ideal schedule. You’ll also discover the power of breaks as a productivity aid and much more. Mr. Pink, it’s been a while. How are you? Daniel Pink: I’m very good, Brian. Thank you, and thank you for calling me Mr. Pink. I appreciate the difference. Brian Clark: Yeah, well, I’m actually making a Reservoir Dogs reference, and I’m Mr. White and I have a cooler name. Every time I think Mr. Pink, I think of Steve Buscemi. I can’t help it. Daniel Pink: Oh man, that hurts. Brian Clark: All right, moving on. The new book is out now and available for purchase. It’s called When: The Scientific Secrets of Perfect Timing. Dan was kind enough to send me an advanced copy. Thank you for that, Dan. How and Why Was the Focus of This Book Your Next Topic of Choice? Brian Clark: I want to ask first, because this is a fascinating topic to me. With serial authors of your caliber, how and why was When the next topic of choice? Daniel Pink: Oh sure. I can answer that question in a longer version of the answer that I could give you that might be interesting to some of your audience. But the main reason is that truly this is a book that I wanted to read and that didn’t exist. I found myself making all kinds of timing decisions in my life. “When in the day should I work out? When should I do my heads down work? When should I abandon a project that isn’t working?” I realized I was making the decisions in a haphazard way. I wanted to make them in a more systematic way. I started looking for some kind of resource to help me do that — it didn’t exist. Then I started looking at some of this incredible research and a whole range of science and said, “Oh crap, in order to read this book, I’m going to have to write it.” So that’s the main reason that I wrote it. Brian Clark: So this is not really about being subject to the whims of circumstance. This is about intentional decisions and timing for various aspects of our lives. Daniel Pink: Yeah, that’s exactly right. When we talk about timing, I mean, sometimes when we say, “Timing is everything,” we sometimes mean fate or fortune, or as you say, Brian, circumstance. Brian Clark: Yes. It’s interesting to me about this book that throughout your career each book more or less touched on our work lives. To me, this book touches more on the person, almost going down a root level or something. Yes, work, but also everything else from exercise to how to start your day, regardless of whether or not you’re trying to increase your work productivity, or whatever you want to call it. Daniel Pink: Yeah, that’s a fair point. The reason for that, I guess, is that that’s where the material led. I think that what’s similar to the previous books that I’ve written is that they’re very much written at a unit of one. It’s very much written, “What can a particular person do?” They’re not written at the organizational or institutional level. But you’re right, I think it’s a fair point — that this might have broader dimensions to which it applies in peoples’ lives. Brian Clark: Cool. One of the early points you make in part one is about a topic that I’ve seen a lot of research on. It’s counterintuitive to this whole hustle and grind mentality that you see out there in the startup world, which of course can spill over to anyone who works for themselves can work too much and also feel like if they’re not, then they’re somehow not measuring up. But you start off early talking about breaks and how important that is. Talk a little bit about the research in that area. Daniel Pink: Yeah, thank you for mentioning that, because I think it’s really interesting and it’s one of the areas where the research, the science changed my own practices. The science of sleep in the last 15 years has caught up. And now we know that that person isn’t a hero, that person is a fool. He’s hurting his own performance, he’s hurting other people’s performance. In my view, reading of the research is that the science of breaks is where the science of sleep was 15 years ago. We’re now realizing that breaks are not a deviation from performance, they’re actually part of performance. I think what’s interesting about this research is that it gives us some, I think, very, very practical suggestions about how we can take better breaks. The main thing is you’ve got to take more breaks. The other thing is that science is telling us what kind of breaks to take. We know that taking breaks, even for an introvert like me, social breaks — that is, breaks with one or two other people — is actually more restorative than going on your own. We know that taking a break, and this is really important today, when you’re fully detached is much, much better than if you’re semi-detached. So take a break and don’t bring your phone with you. When people take social breaks, there’s some interesting evidence showing that they’re better off not talking about work or at least not talking about work all the time. I think this is fairly well-known, and I have incorporated this into my life as well, that if you’re going to take a break, if you can, move rather than stay stationary. This research blew me away — the importance of nature. Breaks are more restorative when you go outside rather than inside. There’s even an interesting piece of research showing that breaks are more restorative if you just simply look outside a window and see a tree, rather than not look outside of a window. Brian Clark: Yeah, there’s so much intersectional congruence between research that I’ve run across doing my other project Further about the power of nature and how it affects us, how we need to move. And then it butts up against this idea of mythical productivity where you’re just kind of grinding it out. No, stop, go outside, take a walk, leave your phone and all of a sudden you just solved a problem. Hey, I say you are working by not working. Daniel Pink: Exactly. That’s the point. We have to think of that activity, Brian, that you just said. Opening up your door, going for a 15-minute walk, that’s part of your performance. It’s not a deviation from it, it’s part of it. Daniel Pink: In the same way that athletes have a cool down period. They don’t have a cool down period, because they’re wimps. They have a cool down period, because a cool down period is part of how they perform at a higher level. What Have You Learned About How to Start the Day? Brian Clark: Let’s talk about… Something I’ve worked on really hard in the last several years is how to begin the day in order to have the right frame of mind to even keep yourself in control of your own timing, if you will. Being intentional, like we said, instead of the day happening to you. We’ve heard about morning rituals, doing the most important thing first. All of this stuff I practice, and if I don’t, I’ll travel and I’ll screw myself all up (I’m not a great traveler). But then I get back home, get back on routine and my life goes back to, well, for me, optimal. I’m sure it could always be better. What did you learn about that crucial moment when you roll out of bed and make the choice between looking at your phone, checking your email, or doing something else? Daniel Pink: There are some specific things you can do to begin your day more effectively. And here we can get really, really, really nitty gritty. I mean, one of them which I’ve started doing is simply to drink a glass of water when you wake up. You’re dehydrated when you wake up, so drink a glass of water. Another one which I think is quite interesting is coffee. It turns out, once I looked at this research, I realized I’ve been doing a lot of things wrong. You look at something like coffee, you’re actually better off not having coffee the moment you wake up. That’s because when we wake up we start producing cortisol and caffeine actually inhibits some of the production of cortisol. What you’re better off doing is letting your cortisol peak, which basically happens after about 60 to 90 minutes. Then having a cup of coffee, say, 60 to 90 minutes after you wake up. There’s a lot to be said for getting some sun early in the morning. And then there’s something also to be said for those of…I know, Brian, thousands of your listeners who are in therapy. There’s some interesting research showing that you’re better off having therapy sessions in the morning. Now, the bigger point here, I think, and these are the specific nitty gritty things you can do when you first wake up, is that what this whole array of science tells us is that there’s a hidden pattern of the day. That is, we tend to move through a day in three stages: a peak, a trough, a recovery. Now most of us move through it in that order. However, there are some of us who are extreme night owls, who move through it in the reverse order. Regardless, what it shows us is this: that during your peak, you’re better off doing what are called analytic tasks. Heads down, writing stuff, auditing a financial statement. The stuff that requires focus and vigilance. That’s better during your peak. You’re better off in your recovery actually doing insight work, which is things like devising a new advertising campaign or brainstorming or something like that. And the trough, which usually occurs for people in the early afternoon, is not good for very much. You’re actually better off doing your administrative tasks that way. If you look at this pattern, what it suggests is: focus your analytic stuff during your peak, which for most of us is the morning. Put your administrative stuff during the trough, which is the early to mid-afternoon, and do your insight stuff during the recovery. That allows us to plan our days in ways that are consistent not with a particular philosophy about what works or what doesn’t, but what this incredible body of science tells us is how our bodies respond to circumstance. Brian Clark: Yeah, my day tracks that way just because, as you said, I’m a morning person. I do the glass of water, but I don’t delay coffee, because I feel like I’ve got to get the mind working right away. But that’s good intel on cortisol. I didn’t really consciously understand the insight in the recovery period, because that happens as you get earlier into evening, because it just happens. Usually I’ll try to close out the work day by reading and then your brain starts working in the background. Daniel Pink: Yeah, I think that’s a good idea. I think what’s interesting about this, and this is where the people who are listening to this podcast, people, Brian, like you and I, have a big advantage. Those of us who are self-employed, we can often shape our days. We can often set our own schedules. There were two reactions. One of them was like, “No freaking way.” The other one was like, “Are you crazy? Why would you want to miss a meeting?” What it shows is that you can take some of this research on this hidden pattern of the day and if you’re running a small operation, you can begin to architect the schedule in a way that is productivity enhancing. And if I can take two steps back, the bigger point here and the bigger point that I’m trying to make in this book is the following: when we think about doing good work — obviously Brian, all your listeners, that’s why they’re listening to this, and that’s one reason why they became self-employed themselves. When we’re thinking about doing good work, we think about, “Okay, what am I going to do? How am I going to do it?” Sometimes, “Who am I going to do it with?” And for years and years and years and years, this question of “When?” has been a second order question. It’s been sitting over there at the kids’ table. One factoid that I think is really compelling is this — that time of day, and we’re just talking here about the unit of the day — time of day explains 20% of the variance in human performance on cognitive tasks. So it doesn’t mean that “When?” is everything, but it’s a fricking big thing. And to treat it as something that’s insignificant is a big mistake. What Does a Person’s Time of Life Have to Do with This? Brian Clark: More of the, I guess, broader personal level, I found it interesting that you really talked about time of life as an aspect of this. And this goes back to when you did Free Agent Nation. A lot of people don’t realize that Generation X is the entrepreneurial generation. And I don’t know if it’s because everyone had written us off earlier or the Internet showed up and we were like, “Money.” I don’t know. But most people who are working on their own (except for probably millennials that had to adapt after the crash) are middle-aged and higher at this point. How does that relate to time of life and what that means to us? Daniel Pink: There are a lot of interesting things on time of life, Brian. Let me give you two that I think are really interesting. Let’s talk about guys in their midlife, like you and I. There’s this idea out there that we will or have or suffer from a midlife crisis. If you look at the research, that’s complete bunk, it’s absolutely not true. The midlife crisis is one of the most dubious ideas I think in the last 50 years in psychological science. There is no evidence of it. However, something else seems to happen at midlife, which is interesting and it is a characteristic of other kinds of midpoints as well. There is a dip. The way to think of it is think of a chart and think of a letter “U”. We tend to have pretty high well-being in 20s, 30s. Into 40s, it starts to dip a little bit. 50s dip even more, but then when we come out of our late 50s or so, it starts going back up. That pattern where midpoints sometimes bring us down is actually very prominent in a number of areas. I’ll give you one instance. First of all, that U-shaped curve of well-being, not this cataclysmic midlife crisis, but just a dip, scholars like Andrew Oswald, David Blanchflower have detected that in 72 countries. What’s interesting, they even detected this kind of pattern in apes. Apes have a sagging well-being in midlife. But even more than that, you see people in the middle of certain kinds of obligations dipping a little bit. One of my favorite pieces of research is from Ayelet Fishbach at University of Chicago, the study of Hanukkah. Hanukkah is an eight night holiday, and Jews who observe the holiday are supposed to light the candles on night one, two candles on night two, three candles on night three, etc., etc. And when she actually looked at peoples’ behavior, what she found was that people light the candles on night one, they light them on night eight and they actually dip in between. There’s a U-shaped pattern for Hanukkah candle lighting. Sometimes midpoints in many, many realms bring us down. There are other times they fire us up, which we can talk about later. Now that’s one part of the stage of life. The other thing that’s very interesting, I thought, and I’m surprised this research hasn’t gotten more attention, is the research from Laura Carstensen at Stanford. She showed something really interesting. If you look at the size of peoples’ friendship networks over time, what it shows is that in our early years, we begin to expand our friendship network. It reaches kind of an apex around our 50s or so, but then around age 60 or so, there’s a dramatic drop in the size of our friendship networks. I mean, it’s a very steep downward curve. Superficially, that seems like a pretty predictable story, that when you get older, you have fewer friends, your kids move away, you’re a little bit lonely. What Laura Carstensen has found is that that is simply not true. What happens is that if you ask people to divide up their friends, their friendship networks, inner circle, middle circle, outer circle, the people who I’m really close to, the middle circle, the outer circle. Around the age of 60 or so, they start getting rid of the people in the middle and outer circles. Essentially, they edit their friends and they focus on that core. So while the size of their total friendship networks decline, the size of that inner circle remains the same. There are these predictable patterns, and that ends up being not only a time of life, but another pattern of endings. When we reach the end of something, we sometimes pursue a greater sense of meaning. How Do Self-Employed People Exhibit a Sense of Autonomy During These Phases? Is there any research that shows a difference between employed and self-employed to the sense of….going back to the topic of Drive, the autonomy, right? Does that make a difference? Daniel Pink: I think so. I mean, I think it makes a difference to the extent that people who have autonomy are more capable of shaping their daily schedules and more capable of reacting to some of these very predictable trends throughout our work in our life. If you think about midpoints, there’s this interesting thing that happens at midpoints where if you look at some other research from Connie Gersick (she was at Yale, now at UCLA) — she found that if you give a team a certain amount of time to do a project, they get started at the exact midpoint of it. So if you give a team 34 days, they get started on day 17. Give a team 11 days, they get started on day six. There’s another thing that we can do. Again, and this is true really for solo operators. There’s some interesting research from the NBA and from NCAA basketball about what happens at halftime. Not surprisingly, basketball teams that are ahead at halftime are more likely to win the game, because they already have more points. It’s not that complicated. But there’s one exception to this rule, and that is when teams are down by one point at halftime. When teams are behind by one point at halftime, they’re more likely to win the game than they are if they’re up by one point. Again, there’s also a galvanizing effect of midpoints, so that when we hit a midpoint of a project or something…again, your self-employed folks are doing entirely project-based work. When you hit the midpoint of a project, if you imagine that you’re a little bit behind, that actually ends up being galvanizing and can give you that inner motivation to do better. That becomes harder to do if you’re not fully in control of the project, as is often the case inside of large organizations. Or if you don’t have the autonomy to configure the project the way that you want to configure it. Brian Clark: Got you. I love that basketball factoid, that it’s a good sign to be slightly behind. The research on this hidden pattern of the day — the peak, the trough, the rebound — some of it comes from analysis of millions and millions and millions and millions and millions of tweets. Some of the research showing that kids do worse in math and worse on standardized tests in the afternoons comes from these analyses of literally millions of test scores. I think a lot of people are less fascinated by this than I am. But I think that the tools that we’re able to use to get insights on behavior now are so, so, so interesting and powerful. We wouldn’t have been able to figure out that point about what happens at halftime were it not for these giant data sets. How Can We Be Intentional When Dealing with Our Networks of People? Brian Clark: Yeah. Got you. One thing we talk a lot about on this show is the idea of the company of one where an individual motivated sufficiently and then aided by technology and networks of other independent people, really Free Agent Nation 15 years later. As I’ve said, you’re just a little ahead of your time sometimes. You’re a great example. Dan Pink is a brand and yet you use contractual relationships with publishers, probably all sorts of other people averaging from designers to what have you, in order to run the Dan Pink Show. Well, so can any individual entrepreneur. A freelancer can think that way as well. When you talked about the secrets of group timing in the book, that kind of blew my mind, because it seems like usually hit or miss or utter chaos, but there’s actually some intentionality we can take when dealing with our networks of people that help us run the show. Daniel Pink: Yeah, a very interesting point. There’s some really interesting research on synchronization — as you say, Brian, how do groups synchronize in time? I ended up writing about these fellows who are called Dabbawalas in India. And what they do is just preposterous. They will go to somebody’s house in the morning, pick up a home cooked lunch and then deliver that lunch to that person’s loved one in downtown Mumbai, 25 kilometers away, and then take the empty container and bring it back to the cook’s house later that afternoon. They’re delivering like 200,000 lunches every single day, and they’re doing it with a degree of accuracy that’s just like FedEx and UPS. What’s amazing is that the guys who are doing this typically have an eighth grade education and they’re doing it without any technology. They’re doing it with trains and bicycles. So how are they able to coordinate like this? When we’re talking about things that require high levels of time and coordination, it turns out that even if it’s an aggregation of independence, that it’s very important to have a clear boss. And this is true when you think about rowers. Rowing teams have a coxswain who calls out the order and everybody listens to that person. Choirs, I did some research on choirs. It’s quite fascinating. Choirs always have a choir director. So one of the things, in terms of group synchronization, is having a clear boss. Another one which I think is quite interesting is that groups that synchronize well have a sense of belonging. They have certain rituals, kind of a certain language, certain kinds of codes. To get back to the basketball example, there’s some interesting research showing that teams where the players — like if you look at the beginning of a season and watch videos of players on certain teams — the players that touch each other, that predicts a lot. High fives, low fives, chest bumps, fist bumps, those end up being predictive of which teams are going to cohere and actually perform well. Then, which comes back to a lot of the stuff that I’ve written, there’s just a sense of purpose and the idea of doing something big and important. I guess one last thing on the synchronization, what I found fascinating is if you look at the research on choirs, choral singing. Choral singing ends up being about as good for us as exercise. I mean, it’s crazy. That is, if you measure someone’s immunoglobulin levels, that is their immune response in their blood before singing in a group and after singing in a group, after singing in a group, they have a higher immune response. You see cancer patients improving because of choral singing. You see people reporting higher senses of well-being, more openness to others, declines in depression. There is something about synchronizing with others in time that gives us a sense of purpose and meaning that’s quite profound. Where Does Flat Organization Fit? Brian Clark: So the need for a clear boss and a culture of cohesiveness. I mean, that works perfectly for what we’re talking about here. Do you find that sort of a further refutation of the Zappos flat organization approach? Daniel Pink: Yes and no. There’s a difference between a flat organization and zero hierarchy at all. I tend to lean towards flatness. But I have to say, and I’ve said this before, even before looking at this kind of research, that I have been skeptical about holacracy, basically having no hierarchy at all, because every single human system since the beginning of civilization has had some kind of hierarchy. Now, it doesn’t have to be this rigid, oppressive hierarchy. But to me, it has to have some kind of spine, even if it’s a gentle one, even if it’s a light spine of hierarchy. What comes out in the research on synchronization is that there needs to be some kind of boss. So the Dabbawalas, these lunch deliverers, are a great example. They have enormous amounts of autonomy in how they do their job. The order in which they pick up lunches, they have incredible autonomy over that. But the one area where they don’t have any autonomy at all is that there is a certain train that they need to make, leaving from suburban Mumbai to downtown Mumbai. For them, the clock is the boss. If they don’t make that particular train, everything crumbles. So in that sense, the clock is the boss. With choirs, there is actually some amount of autonomy on the part of individual singers expressing themselves in the most robust way, and yet their eyes are on one person who is the clear boss. I think it’s possible to have flatness, but still have a modest hierarchy. And that to me seems to be the systems that work the best. Daniel Pink: So, Brian, if you look at your own operation, like for you, you’re the boss. You have people who work with you on your various Copyblogger and your whole Brian Clark enterprise. My hunch is that you have the relationships, whether they’re contractual relationships or the extent you have any employee relationships, are fairly autonomous on the nose and yet you’re still the boss. And I just have come around to believe that every human system for efficiency’s sake requires some amount of hierarchy. I think where we’ve gone wrong is that we have deified hierarchy and we made these incredibly rigid hierarchies. There’s almost an organismic view of it. It’s like you have to have some kind of a vertebrae. You don’t have to have a steel backbone and immobile arms and legs, but probably being a jellyfish isn’t that helpful either. You need sort of a flexible kind of backbone of hierarchy for things to function effectively. Brian Clark: Yeah. It’s interesting. In my own example, yes, we definitely have a lot of employees. And now we’ve got a great VP level leadership team to where they’ve literally made me into a figurehead, like the person that people look to strategically and philosophically. What’s the Big Picture Takeaway on Timing? Brian Clark: If you could leave Unemployable listeners with one takeaway on timing, what do you think the big picture thing is that people may need to change their mindset about? Daniel Pink: Well, I’ll give you the super big picture. The super meta big picture thing would be this: you need to start considering your “When?” decisions with the same seriousness as your “Who? What? and How?” decisions. That’s the meta thing. I guess the other more micro tip that I would offer people would be, especially for the Unemployable listeners out there: you have control over your day and you need to be intentional about how you do that. The science of timing offers us a way to do that very effectively. Most people are either morning types or in between. You should do your analytic work in the morning. You should do your administrative stuff in the early to mid-afternoon. And you should do your insight work in the late afternoon and early evening. Period. Don’t let other people or other circumstances encroach into that. Those “When?” decisions of how you can figure a day are as important as what you actually do. I mean, they have a material effect on our performance and our well-being. I think the great opportunity, especially for Unemployable listeners, is that you guys have this ability to structure your days and structure your schedules in a way that’s right. You’re not a hostage of a boss. But you need to be very intentional and you need to bring these “When?” questions from the kids’ table to the grownups’ table. Brian Clark: It’s great advice. The book is called When: The Scientific Secrets of Perfect Timing. You can pick it up at Amazon or any still existing bookstore that you can run across. Dan, thank you so much for taking your time. Guys, check this book out, because there’s so much more in here than we were able to cover. I just had a few key things that I really thought were relatable to you guys. But the whole book is incredibly useful. So again, Dan, another home run in my estimation and thanks for your time. Daniel Pink: My pleasure. Always a pleasure to talk to you and the Unemployable crew. Brian Clark: All right, Everyone, intentionality in your day. Take breaks. Go on walks. It’s all work, one way or another, but it doesn’t have to be you sitting there at the desk. Just remember — taking breaks, taking care of yourself is all a major part of keeping going. Take care, we’ll talk next time.